Sven Olof Joachim Palme joined the Social Democratic Party in Sweden, becoming head of its youth section in 1955 when he was 28. Three years later he became an MP and in 1963 joined the cabinet for the first time. On 1 October 1969 he became prime minister but lost power in October 1976 when he tried to raise taxes to pay for welfare benefits. He was returned to office in 1982. He had many admirers but also a large number of enemies for his stance against American involvement in Vietnam, nuclear weapons and Franco; and for his support for sanctions against South Africa and the Palestinian Liberation Organization. Four years later, on 28 February 1986, he and his wife, Lisbet, went to the cinema. They left to walk home. 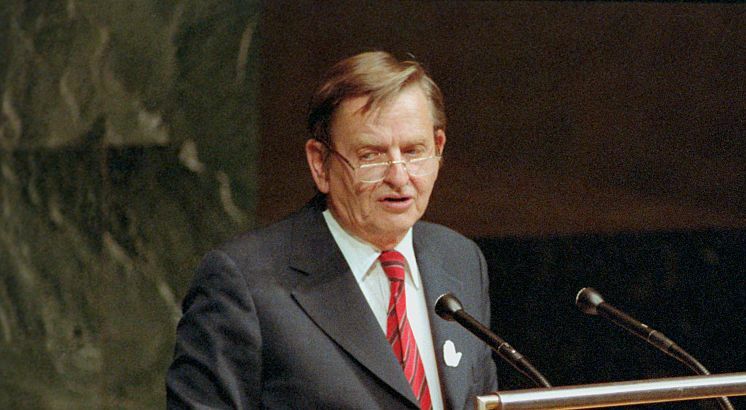 Palme did not have any bodyguards and freely walked the streets day and night. That night at 11.21pm, as he and Mrs Palme walked down Sveavagen in Stockholm, a gunman shot Palme in the back outside a pen shop. Mrs Palme was also shot but recovered. Two young women nearby rushed to help the stricken politician. The prime minister was taken to hospital but was pronounced dead at 12.06am on 1 March 1986. A reward worth $5 million was posted for information leading to the capture and conviction of Palme’s killer but no one came forward. Various names, nearly all with right wing connections, came into the frame for the killing. One of these people was mentioned, but not identified, by a policeman in his book about the case and then was himself murdered in North Carolina, America. In December 1988 an alcoholic petty crook called Christer Pettersson, aged 41, was arrested for the murder and picked out of a line-up by Mrs Palme. He was sentenced to life imprisonment but released in 1989 after his conviction was deemed unsafe. Despite his acquittal, Pettersson once confessed to shooting Palme. “Sure as hell it was me who shot [him], but they can never nail me for it. The weapon is gone,” he told Swedish writer Gert Fylking in 2001. He later retracted the statement and said he was not involved in the killing. He died at the Karolinska University Hospital, Stockholm on 29 September 2004 of brain haemorrhaging and organ failure. The gun used in the murder was never found and officially the assassination remains unsolved.